Are you ready for your next camping trip where you can relax, and make plenty of memories with your family and friends? 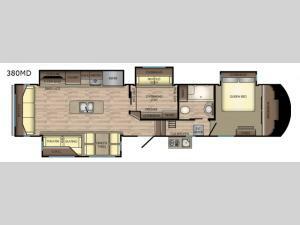 Well, come choose to camp with this quad slide out Volante 380MD fifth wheel. You will love the open spacious floor plan in the kitchen and living area which features an island plus there is a sofa along the rear wall and theater seating within the curbside slide out. The second bedroom can be used not only for sleeping space, but also as a den. Here there is a tri-fold sofa and above there is a loft where you kids can hang out. When the weather is nice you will want to spend more time outdoors watching your kids play or ride their bikes while you prepare a snack or your evening meal at the outdoor kitchen!